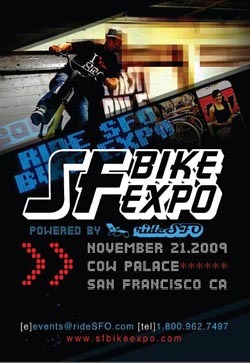 Come and join us for the 2nd Annual San Francisco Bay Area Bicycle Expo at the Cow Palace November 21, 2009. Exhibitors include everyone from bike manufacturers, eco-friendly vendors, bike shops, teams, and advocacy groups. Keep in mind the San Francisco Bay Area, the birthplace of mountain biking and is a hot-spot of everything bike related. Entrance fees and booth rates are very affordable, and can be tailored to fit your budget and schedule. This will also give you an opportunity to view 2010 lineup or sell your used goods.